This is a brand new Valby CH140HF Wood Chipper with Hydraulic Feed. This is the machine for people who have use for a small durable chipper. You know this machine was built to last because of the hefty 780 lb. weight. The heavy cutter disk carries a lot of inertia, which helps the chipper run smoother, is easier on the tractor, and enables bigger pieces to be chipped without stalling the tractor. The quality spherical roller bearings enable the chipper to be used at any PTO speed, up to 2,000 RPM. The Ch140HF woodchipper is recommended for use with tractors with a horsepower range of 15 hp to 40 hp. The low feeding point ensures effortless feeding of the chipper. The operator can stand with a straight back. 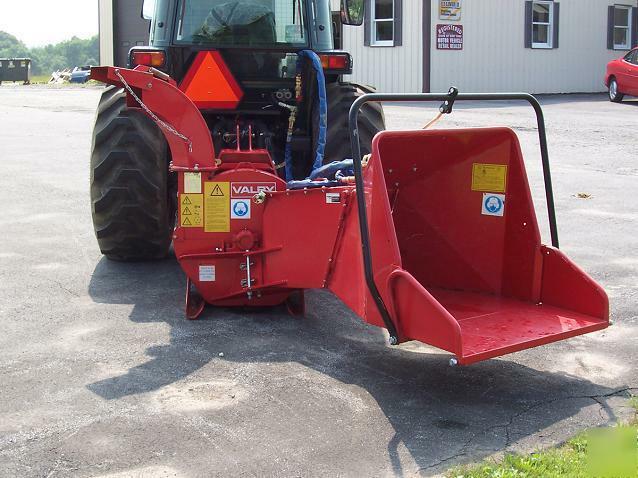 The chipper stands by itself on the ground and is easy to hook up or remove from the tractor. Chipping Rotor Diameter: 26 3/8"
Knives Two 8 3/4" x 3 7/8" full size knives. The Valby chippers do not have any knife motion toward the operator. This reduces risk of material flying back through the feed chute. The discharge height is under 4 feet so the chips fly out below eye level. To accomplish safe operation in various wind directions, the Valby chippers discharge direction is adjustable 360 degrees. An adjustable deflector bonnet enables placing the chips near or far. The chipper feeds the material smoothly and does not jerk it from the operator's hands. The knives are counter sunk into the disk for safety. The upper housing of the chipper opens up for easy access to the knives. The knives can be sharpened about 50 times before replacement. The changing of the knives takes about 10 minutes. The knives are easy to get to, and no special tools are needed for the change. The discharge chute is low so the chipper can be stored in low buildings. The feed chutes of the chipper are on a hinge, so the chute can be folded to the side for access to the anvil and knives. The feed chutes are detachable. One can hook up either feed chute option to an existing machine. hydraulic feed pulls limbs and brush in.